This is the chance of a lifetime to explore two of the most diverse, unique and breath-taking regions in the planet. Spanning over 14 nights, this adventurous and exciting guided tour offers plentiful opportunity to delve into the rich culture, fascinating heritage and incredible landscapes of Peru, particularly the sprawling Inca citadel of Machu Picchu, and the enchanting Galapagos Islands, home to phenomenal untouched scenery and prehistoric wildlife found nowhere else in the world. Your adventure begins with two nights in Lima, Peru’s sophisticated and historic capital. 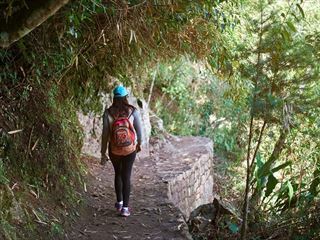 Enjoy a full city tour around the colonial facades, stylish suburbs and significant sights before journeying to the Sacred Valley of the Incas, where you’ll discover isolated weaving villages, bustling markets and glorious Inca citadels, and immerse in a selection of traditional cultural workshops and demonstrations. 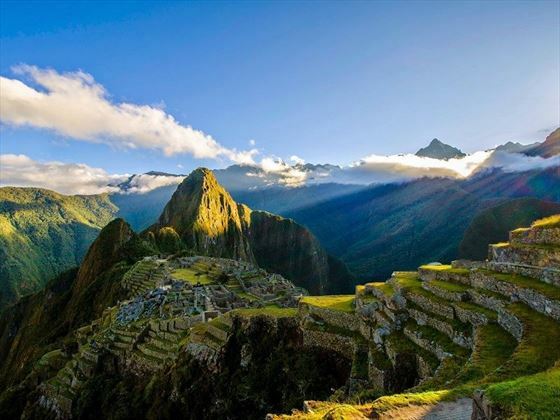 The undoubtable highlight of Peru, and perhaps even the most famous archaeological site on the continent, is the awe-inspiring, ancient city of Machu Picchu. You’ll spend a night at the base of this spectacular site, with two opportunities to soak up its glorious sights and captivating atmosphere. 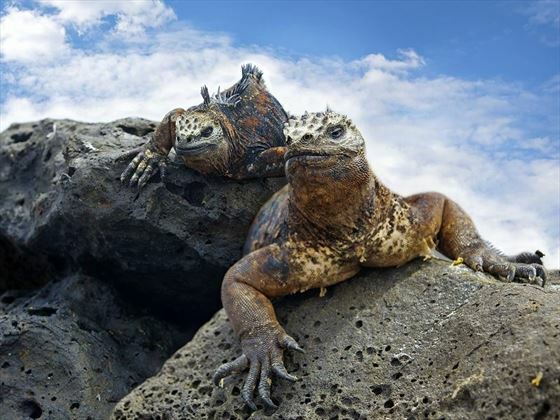 You’ll then enjoy a couple of nights in the UNESCO-Listed cities of Quito and Cusco, before embarking on a Galapagos eco-cruise adventure, starting in the stunning San Cristobal Island. 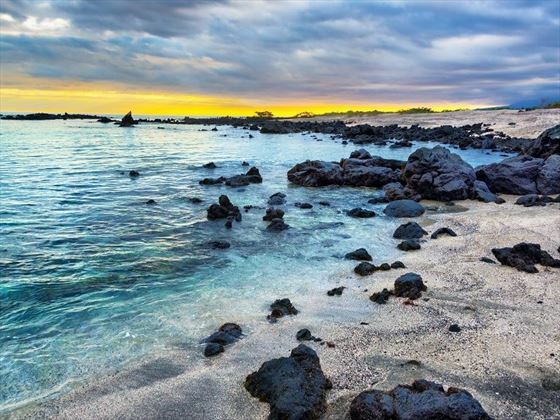 This isolated group of volcanic islands and its fragile ecosystem offers a mythological status, showcasing a spectacular array of biodiversity and rare, unique fauna. Throughout your time here, you’ll have the chance to swim and snorkel with the breath-taking marine life, from manta rays and sharks to playful sea lions and majestic turtles, and explore magnificent landscapes of dormant lava tubes and luscious highlands; you will also trace Darwin’s discoveries as you observe graceful flamingos, blue-footed boobies and penguin colonies, even visiting the famous Charles Darwin Research Station to see giant, prehistoric tortoises up-close (CL). Arrive in Lima late this evening, transfer to your hotel for check-in and spend some time at leisure soaking up your surroundings. 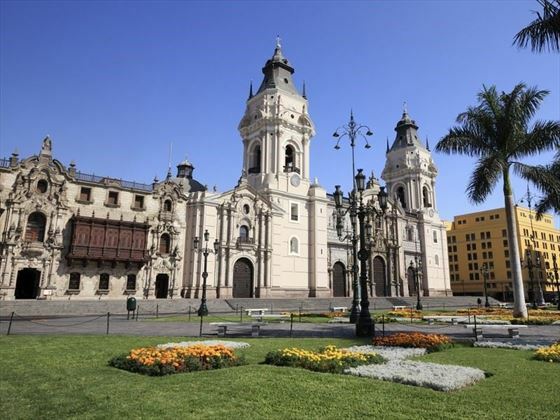 Discover Lima’s fascinating history with a guided tour through the UNESCO World Heritage-Listed city centre. Admire the artwork and enter the catacombs at the San Francisco Monastery, view the Government Centre, the elegant Plaza de Armas Cathedral, an abundance of colonial architecture and the fashionable suburbs of San Isidro and Miraflores. Afterwards, you will visit the former house of the conquistador Jeronimo de Aliaga y Ramirez. This evening, get to know your fellow travellers during a welcome dinner and a tasting menu of wonderful Peruvian cuisine; you will quickly discover why Peru has been named the world’s top food travel destination four years in a row. 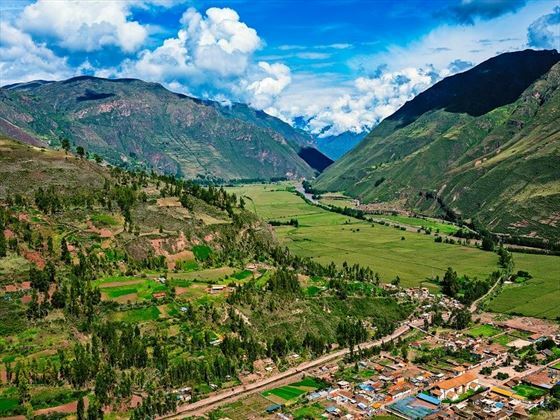 Today you will fly to Cusco, and then journey through the Andes to the majestic Sacred Valley of the Incas. 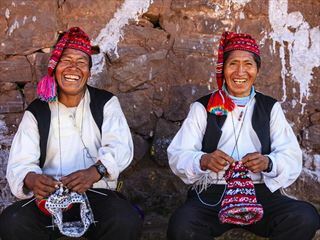 Learn the centuries-old methods of spinning, dyeing and weaving traditional textiles during a visit to Awana Kancha, a living museum of the Peruvian Andes. Make a visit to Pisac Village to browse the colourful handicraft market before settling into your hotel in the heart of Sacred Valley. The rest of the evening can be spent at leisure, perhaps take this time to discover the hotel’s planetarium to enjoy some stargazing. You’ll visit the spectacular Ollantaytambo archaeological site this morning, a uniquely terraced Incan settlement which reflects the ancient heritage and architecture from the Inca period. Then you’ll head to the Pablo Seminario Ceramic Studio, where you’ll get first-hand knowledge on this internationally-renowned artist’s techniques and designs inspired by ancient Peruvian cultures. 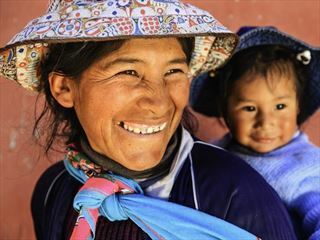 By noon, you will experience the lifestyle of the modern Andean people, and delve into their culture when you travel to a nearby community and interact with the locals; get a true taste of their daily life by participating in small group workshops, which teach traditional methods of growing, harvesting and weaving. Celebrate the culture as you learn their dances and listen to traditional musical instruments before enjoying a home-made farm-to-table lunch created with local specialities. Tonight, savour an authentic Pachamanca dinner, a unique process where food is placed on hot stones and buries in the ground to cook. This morning you’ll fly from Cusco to Quito, a UNESCO World Heritage Site and Ecuador’s stunning capital city. 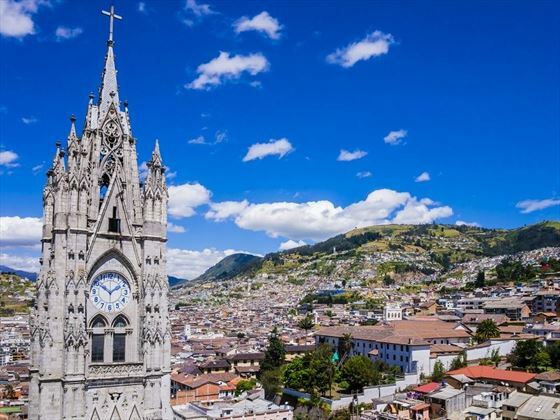 Enjoy a full city tour of Quito, and a special visit to a Children International Community Centre. Learn about Quito’s colonial centre and explore the Presidential Palace and 17th Century Church of La Compania. Savour lunch overlooking the Pululahua volcanic crater, and cross hemispheres at the Equatorial Line Monument and Museum at the ‘Middle of the World’. Spend the rest of the day exploring Quito at leisure. 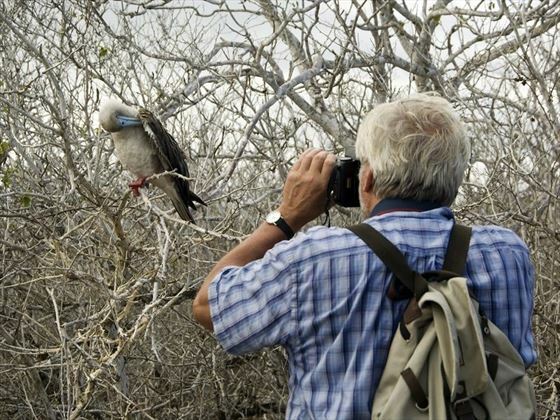 Fly to the stunning San Cristobal Island, gateway to your Galapagos eco-adventure. After lunch aboard the cruise ship, arrive at the Port Baquerizo Moreno for an incredible visit to San Cristobal Cerro Colorado Tortoise Reserve. After exploring the island, spend some time stargazing on the ship’s deck and toast with a tropical cocktail. 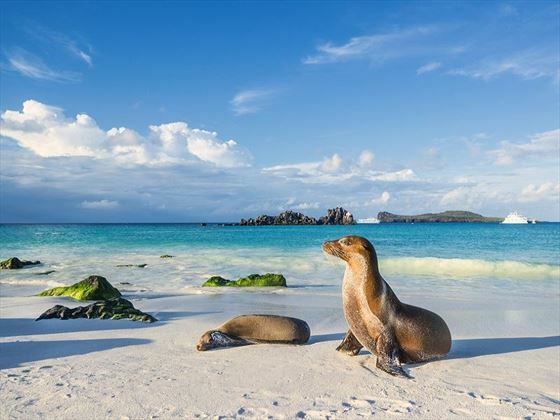 Board your panga to visit Gardner Bay, home to a colony of sea lions, Galapagos hawks and endemic finches that reside on the pristine beach. Swim and snorkel with the breath-taking marine life, including manta rays and white-tipped sharks. 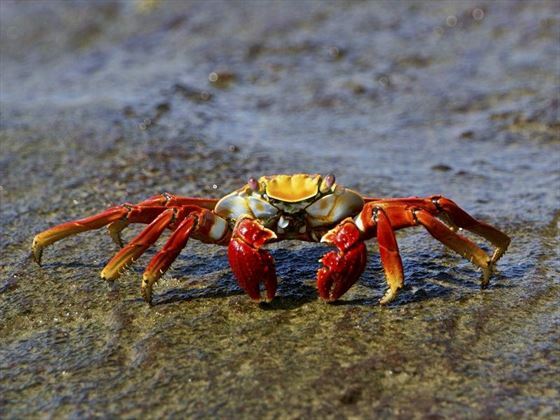 Continue to the magnificent volcanic terrain of Suarez Point and enjoy a guided nature walk, watching out for hooded mocking birds, lava lizards, blue-footed boobies and crabs. Your last stop is the spectacular Soplador blowhole, where water shoots 75-feet into the air. Land at Post Office Bay and learn about its historic stories before enjoying stunning snorkelling with green turtles, or setting out in search of Darwin’s finches and yellow warblers. Sail to Cormorant Point and its unique green sand beach; try to spot sting rays and reef sharks in the clear, emerald waters. Learn about the ecosystems unusual flora, and observe graceful flamingos or spot a small colony of penguins. Then, seize a second chance to snorkel and swim near playful sealions. Visit the famous Charles Darwin Research Station and see the giant tortoises from the station’s breeding programme. 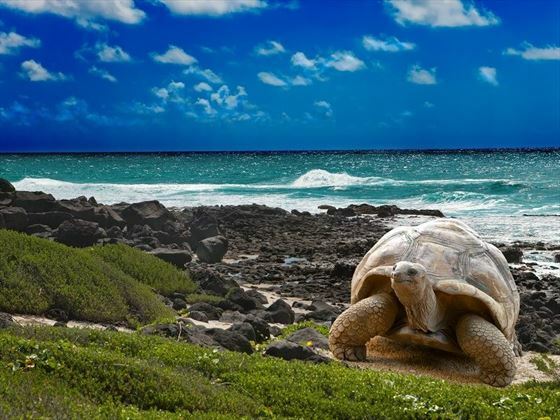 Drive through the Santa Cruz highlands to Cerro Chato see more giant tortoises, taking a break to savour some organic Galapagos coffee before embarking on a walk inside the dormant lava tubes. Enjoy the rest of the day at leisure exploring Port Ayora. 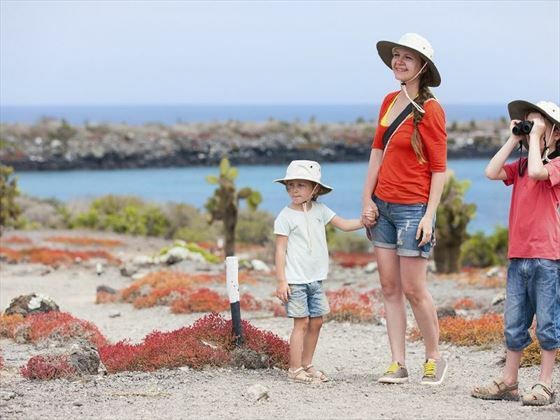 Admire magnificent panoramic views as you circumnavigate Carrion Point, keeping an eye out for marine iguanas, fur seals and crabs along the rocky shoreline. Bid farewell to the Galapagos and fly back to the stunning city of Quito, where you’ll enjoy a night-time panoramic tour around the glowing lights and colonial buildings en-route to your farewell dinner at one of the city’s most historic restaurants. Your tour will come to an end today as you check-out of your hotel and transfer to the airport in time for your departing flight home.